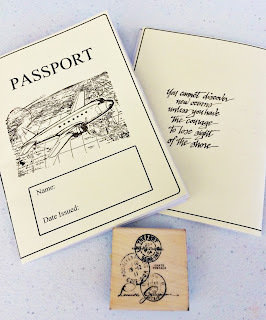 I created a template to save ink, then filled in the space with the airplane and the quote with stamps. The inside pages are from this template, and each time a child comes to the program, they get a special stamp on the inside. I try to choose stamps that have to do with the specific location, so the Netherlands was a tulip. If they "travel" to so many of the locations, they get a prize! When they come in, I always have a playlist of that country's traditional music playing. This month, I chose one that was already made HERE. Usually I'll create one myself, but this one seemed to work fine. I often use the fireplace to mount my central information. At the time, I didn't have a world map to show where the Netherlands are in relation to us, but that issue has since been fixed! I also include the country's map with the capital, their country flag, and some main facts. I started by asking a few questions to see what the kids already knew. One kid knew that they wear wooden shoes, and that was about it. May it be noted that his mother had visited Amsterdam prior to this program. Case in point, this is exactly why I'm doing this! 1. Rotterdam is one of the world's busiest sea ports. 2. The Peace Palace is the seat of the International Court of Justice. 3. The Delta Project and the Flevopolder were created to protect the Netherlands from flooding. 4. The third Tuesday in September is the opening day of parliament. 5. The Ridderzal is the historic castle where the Royal Family resides and dates from the 12th century. 6. The densely populated western area of the Netherlands called Randstad. 7. Amsterdam is the capital of the Netherlands. 8. Some famous painters from the Netherlands include Vincent van Gogh, Johannes Vermeer, Rembrandt van Rijn, M.C. Escher, Piet Mondrian, and Karel Appel. 9. The Anne Frank house is located in Amsterdam. 10. The official currency of the Netherlands is the euro. Each station has a description of the history and uniqueness of the specific craft they are making. I also provide examples as well! This was pretty simple. 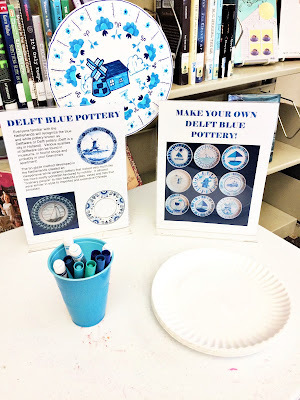 I just grabbed all the blue markers I could find and put some paper plates down. That's all you need! 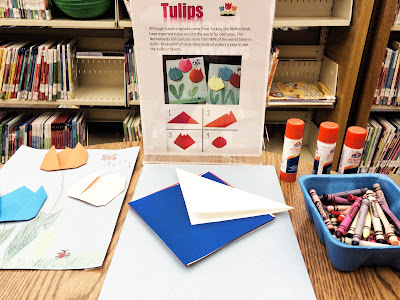 A lot of kids ended up taking the paper and making random origami after they made their tulips. Which is cool, but make sure you don't put all of your origami paper out! This, along with the Delft Blue Pottery, was more open ended. 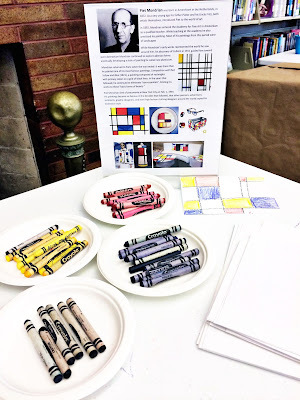 I organized the crayons by color and the kids could emulate Mondrian's art in their own design. The only colors you need are black, red, blue, and yellow. This is a great project to help kids with primary colors and geometric shapes. RECEPTION: I received great feedback from this program! I also made a suggestion box so people could tell me what they wanted to get out of it. I had several parents say they wanted to come back and they loved the idea of the passports. There were also a lot of great projects! 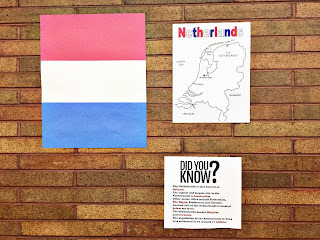 Check out my list of books related to the Netherlands HERE. Follow My Netherlands Board on Pinterest.